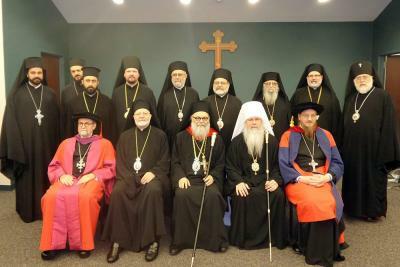 On Monday, July 27, 2015, the Board of Trustees and Faculty Council of St. Vladimir’s Orthodox Theological Seminary bestowed a Doctor of Divinity degree honoris causa upon The Most Blessed John X (Yazigi), Greek Orthodox Patriarch of Antioch and All the East [read the Citation here]. In his remarks following the ceremony, His Beatitude underscored the bonds of unity—past, present, and future—between the Church of Antioch and the seminary, He also captivated the hearts of the more than 200 people who had gathered to honor him, as he passionately called for peace for all peoples in his homeland of Syria and its neighboring countries in the Middle East. 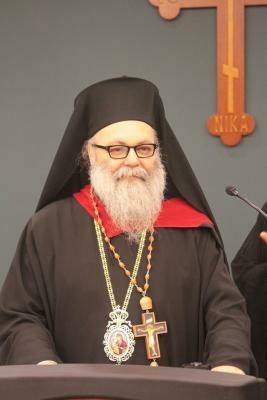 “I am very thankful for two important facts,” His Beatitude began, “first, for the numerous Antiochian priests and bishops who received their theological formation at St. Vladimir’s Seminary, and second, for the longstanding relationship that exists between the [Antiochian] Archdiocese and the seminary, a relationship fostered by the late Metropolitan Philip of thrice-blessed memory, which continues to be strengthened today by my brother [in Christ], Metropolitan Joseph. “As well, I look forward to strong cooperation between the St. John of Damascus Institute of Theology at the University of Balamand and the seminary,” he said. Patriarch John then engaged the audience in a question and answer period, offering a rare look into the centuries old multi-religious and ethnic communities of the Middle East. He especially corrected misperceptions promulgated by Western media regarding the fierce conflict in that region and the solutions for peace desired by its indigenous peoples. “First and foremost,” he began, “We need your prayers, [but] there is a need to make a clarification about the situation that we encounter in the Middle East: words like ‘terrorism’ and ‘extremism’ are all foreign to our land. We don’t know anything about these words in our region. “We are the fabric of that land—Christians and Muslims—and we live together, and we are peaceful in all aspects,” he explained, citing many examples of cooperation, including an evenly split Christian-Muslim population at the University of Balamand and Muslims seeking refuge in Christian homes as they flee from warring combatants. “Unfortunately the media today can express a picture that is totally foreign from what is really happening in our area. We in that region—Christians and Muslims—seek peace, love safety, and there is nothing that separates us from one another,” he commented. “Those who want to help the Christians need to find a way to provide peace in the Middle East. Give us peace, not protection,” he urged. “Second, we face many challenges, and we encourage our people to remain steadfast where they are in their own countries and homes,” he said. “But it is not enough to tell them: ‘Stay where you are, don’t leave your home.’ We have to be with them, help them, feed them, and send their children to school.” His Beatitude related that more than 6,200 schools in Syria have been destroyed thus far and that humanitarian aid is desperately needed. Lastly, Patriarch John thanked the seminary and those gathered for their warm greeting and the honor bestowed upon him. He further encouraged all to relate his thoughts and words to U.S. official and leaders, in order to secure the peace in the Middle East.